To complement our Land Rover and 4×4 work we service and repair most makes of trailers including horseboxes. We carry a good level of stocks to enable us to service and repair trailers within the day. 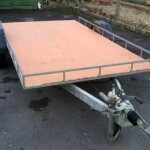 Our stocks cover most makes of trailers with Knott and Alko braking. We carry shoes, cables, jockey wheels, springs and lights etc. A twin axle trailer can be serviced and checked for around £100 + vat with the brakes stripped down, cleaned and adjusted. As with all of our services you will also receive a detailed service report for all of the items checked. If you wish to do the work yourself we can also just supply the parts.